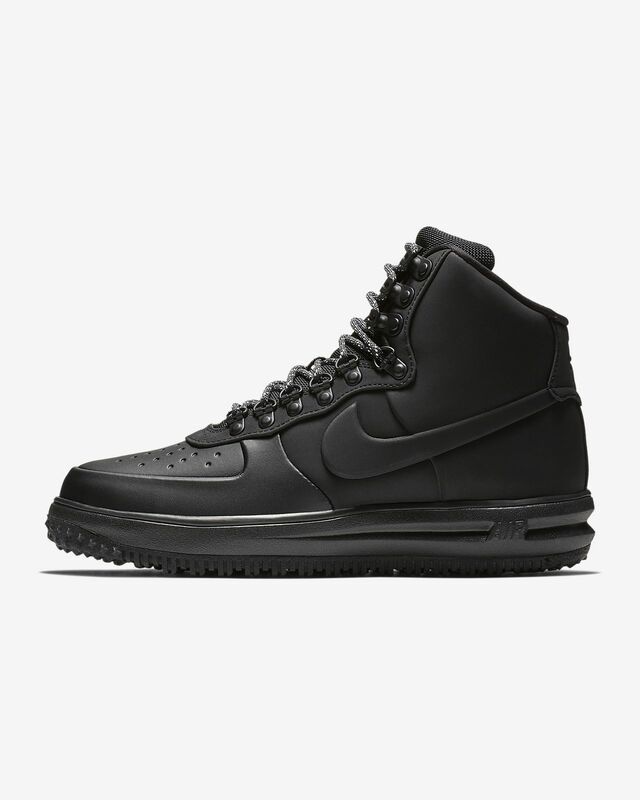 The original AF1 sneaker gets a cold-weather makeover with the Nike Lunar Force 1 &apos;18 Men&apos;s Duckboot. It&apos;s equipped with a water-repellent synthetic upper and a rugged outsole so you can face the elements in comfort and style. Bought these as i wanted something more comfortable than my timbs to wear in the cold when it's icy and/or snowy. They're good, the grip is good and they're warm. Exactly what i wanted. Would recommend if you're looking for a shoe that can hold its own in the winter! Awesome, but a little overestimated. My first thoughts on the shoe before I bought it online was that it’s merely the best outdoor Nike shoe out there, the looks are beautiful. When I bought I felt the material, it felt great, it felt luxurious. Once I put it on, it seemed a little complicated to tie it, but was easy to learn. The shoe was a little uncomfortable due to the structure but it’s not that bad being I’m a person who wears high tops and low tops. I will say that the shoes definitely run wide but you would need to get a size .5x more than your normal size as the shoe is not true to size. My suggestion? I think that if you’re looking for good stylish winter shoes, these are for you. I personally think these shoes are great overall.